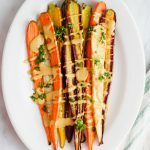 These Roasted Rainbow Carrots are perfectly caramelized topped with a sweet and tangy maple dijon sauce! The perfect, easy side dish! To be quite honest, when I was little, I used to only eat carrots raw. Dipped in a TON of ranch dressing. It was basically an abomination if they were ever in my chicken noodle soup. I would throw a fit! Oh how time (and taste buds) change you for the better! Now I love carrots! I especially love them roasted. It brings out such a wonderful depth of flavor, enhances the sweetness, makes them super tender yet somehow still remain slightly chewy but not like raw carrot chewy like perfectly roasted delicious carrot chewy, you know what I mean? I knew you’d understand. So! 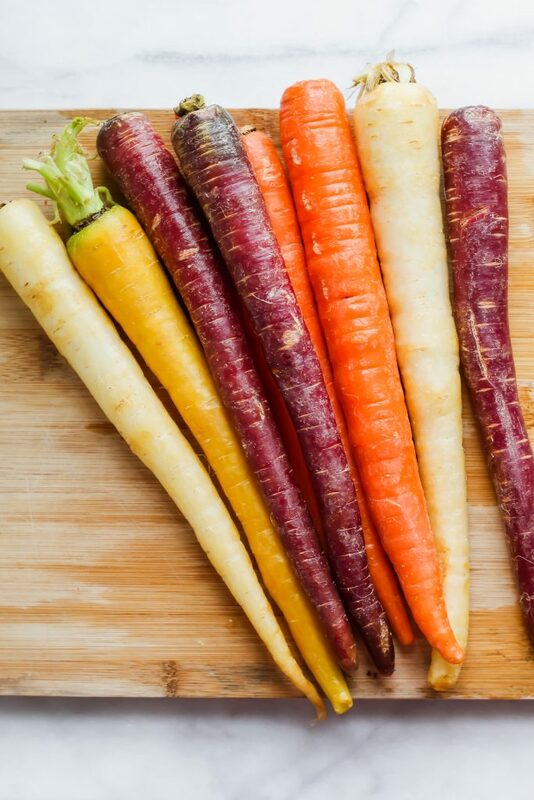 These carrots aren’t just any old carrots…they’re RAINBOW CARROTS. Oh yes, I went there. Purple and yellow and ….well, orange. Rainbow carrots don’t taste any different from normal carrots but they sure are more fun! But I must tell you something I just found out regarding these carrots When I sliced them in half before I roasted them, the inside of the purple carrot was YELLOW. Did anyone else know about that?! Mind blown! 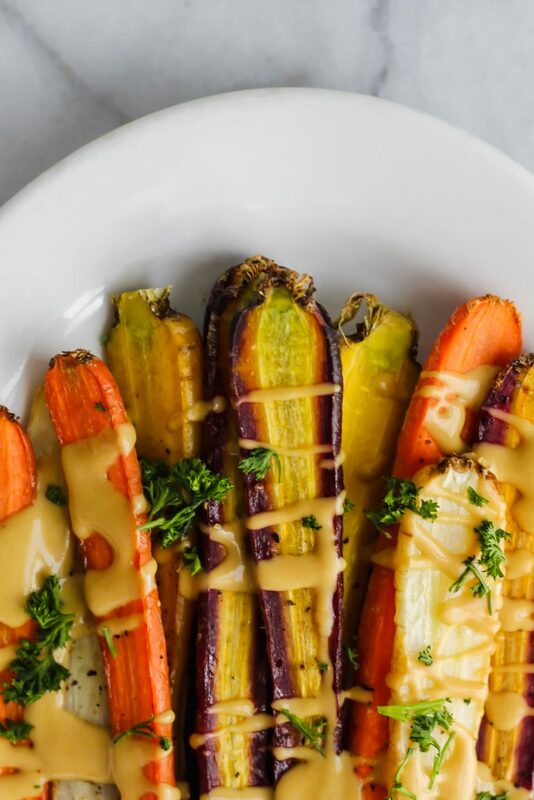 Okay so these Rainbow Carrots are roasted to perfection. Did I mention they are doused in the most finger licking good Maple Dijon Sauce? Literally requires two ingredients: maple syrup and dijon mustard. 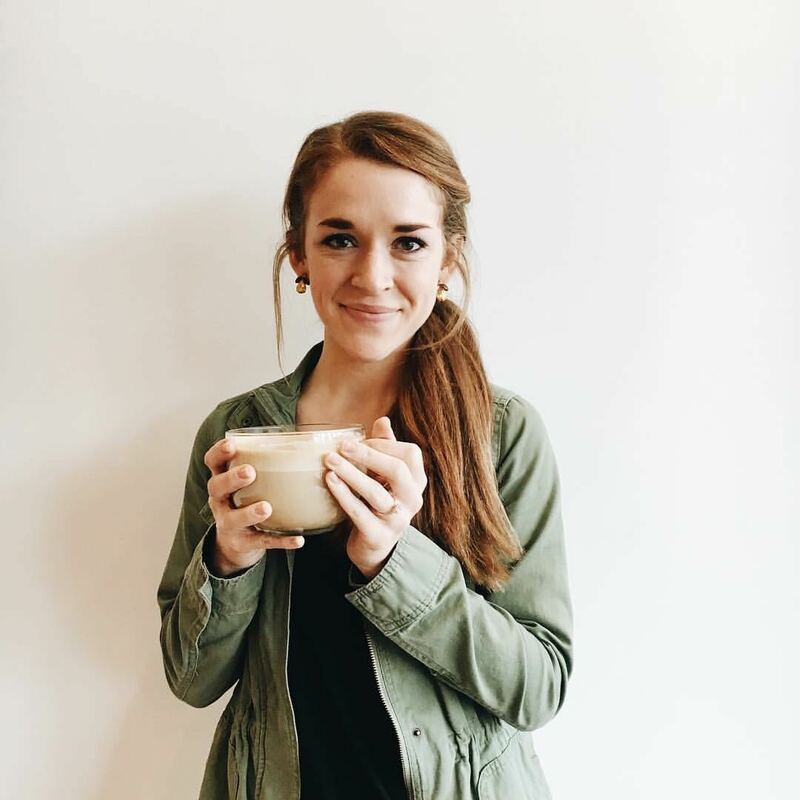 It’s sweet, it’s tangy, it’s packs a small punch but also is balanced with sweetness of the syrup. 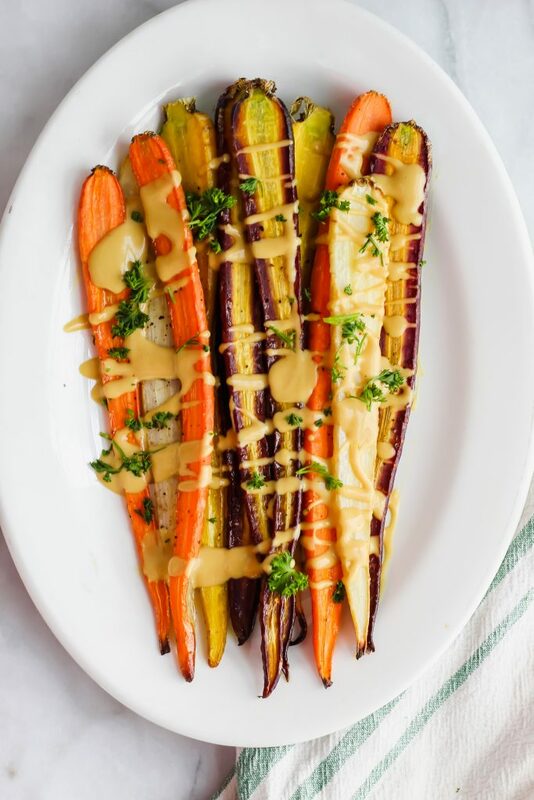 The sweetness of the syrup highlights the natural sugars in the carrots – and the dijon really gives that extra “ooomph” you’re hoping for when eating a dish like this. So let’s get into how to make them! Preheat the oven to 425. Carefully slice your rainbow carrots down the middle. Place them on a baking sheet and add a splash of olive oil and crack of salt and pepper to coat them. Roast them for 25-30 minutes or until fork tender. Once they’re done, make your sauce. In a small bowl, add dijon mustard. To that bowl, add your maple syrup and a pinch of salt and pepper. Combine. Adjust seasoning if needed. If you prefer your sauce sweeter, add more syrup. If you like it tangier, add more dijon. Add a teensy splash of water if you need to thin it out. 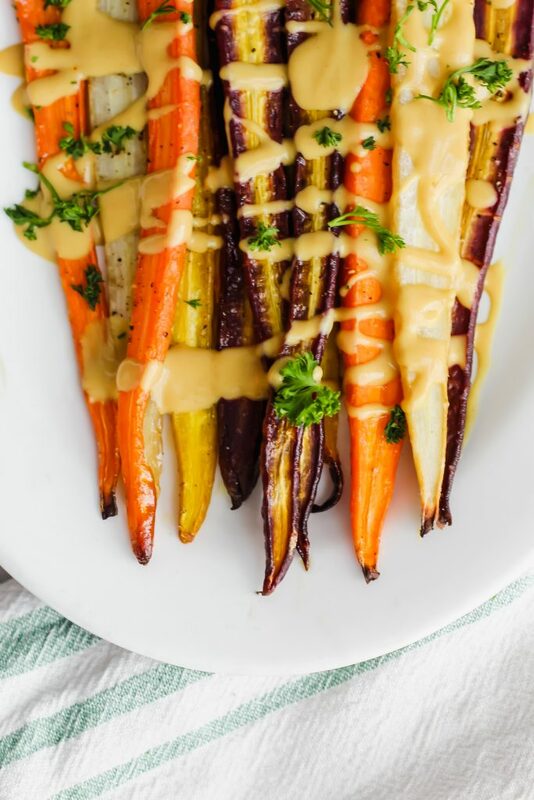 Place your carrots on a large plate or serving tray and then drizzle your sauce on top generously! Garnish with something green to make it extra beautiful (I added parsley) and eat while warm! Y’all know that Easter is right around the corner. 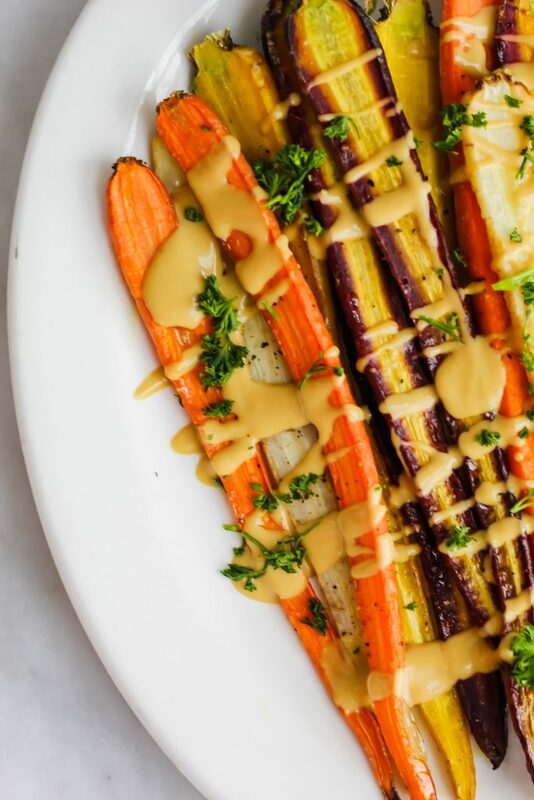 These Roasted Rainbow Carrots is one of those recipes that looks so super fancy but in reality took SO little effort and to be honest, I’m all about that. Less work cooking = more time with family + eating said food. Enjoy these! Preheat the oven to 425. 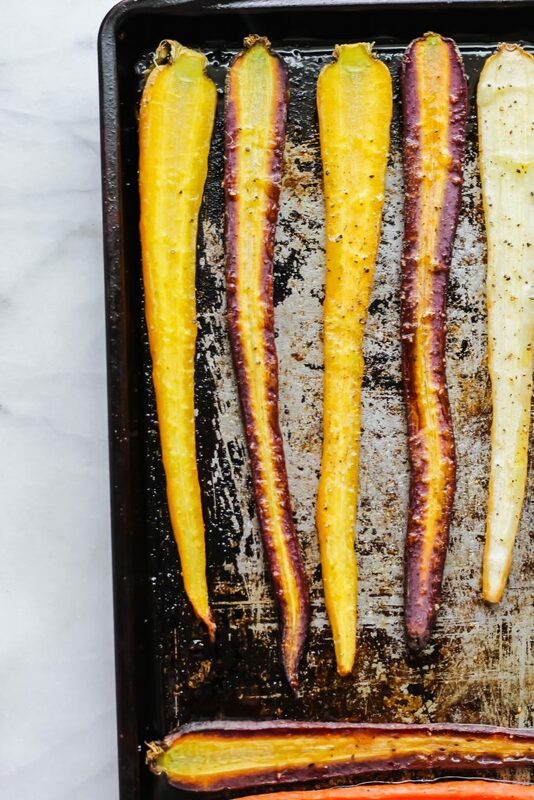 Slice your rainbow carrots in half and place them on a baking sheet. Drizzle the olive oil on top. Add salt and pepper. Roast them for 25-30 minutes or until fork tender. In a small bowl, add the dijon mustard, maple syrup, and a pinch of salt. Mix until combined. Taste to adjust seasoning. Want it sweeter? Add more maple syrup? Want it more tangy? Add more dijon mustard. If the sauce needs to be thinned out, add a splash of water and mix well. Once the carrots are done roasting, place them on a large plate or serving tray and drizzle them with the sauce. Add chopped parsley if desired for garnish. Serve while warm! I didn’t know they were yellow on the inside! The colors are stunning and I’ll bet the taste is amazing! Roasted carrots are a perfect vegetable side dish! Haylie, these carrots are so beautiful! Love the colors and roasting them makes them so sweet and delicious. The maple Dijon sauce sounds amazing! Thanks, Kelly! Yes! The roasting really brings out that delicious sweetness. Carrots are totally underrated! Tasty and pretty, the carrots would be a hit at our table.